IM Adu 'threepeats' at Charlottesville! Oladapo Adu torched the field in the Charlottesville Open winning all five games for his third consecutive title, or "threepeat." The tournament took place on July 15th-16th with 57 players and five National Masters. Adu discusses his toughest encounter against Samuelson Andrew (2251 USCF). "He also happens to be someone I always have problems playing against. I was on the black side of the Sicilian Najdorf, but on move 5 instead of the normal 5...a6 after 5.Nc3, I played 5…Bd7 because I prepared a line in that variation against my opponent." Adu fought to and endgame with double rooks and opposite-coloured bishops. He was able to mount an initiative forcing his opponent to sacrifice the exchange to stave off the attack. 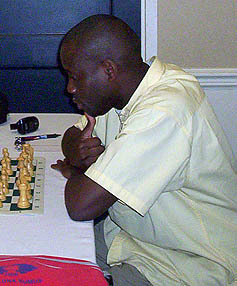 Adu later returned the exchange for a pawn and won the resulting ending in 77 moves.